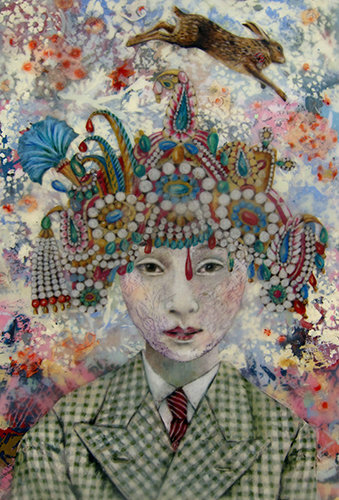 Artist Lori Field creates dreamlike worlds filled with ornate and fanciful characters. Please visit her website to see more of her art. My encaustic paintings and drawings portray hallucinatory visions derived from my flirtation with symbolic realms, personal fairy tales, and the human world. The chimerical creatures that populate my mixed media work are at once familiar and mysterious. They are a realization of modern day myths that draw on primitive lore. My fanciful visual and cultural vocabulary is embellished with elements such as thread, lace, and insect wings—a mélange that hopefully inspires and seduces viewers to look more closely. Primarily self-taught, I’m a former textile designer and illustrator who returned to making fine art when a series of life-altering events caused me to rethink the direction I wanted to take with my creative energies. Since then, I have been included in many group and solo exhibitions nationally and internationally. My goal is to expand upon my existing work in drawing and painting by creating work in various new mediums including artist books, textiles, wearable sculpture and drawings, ceramics, rugs, tapestry, wall murals and animation. I’m working on a suite of lithographs featuring my mythological interpretations of the tiger. My son, a painter and filmmaker, and I are collaborating on an animated film of the figures in my silverpoint drawings and encaustic painting. I am also working on an installation of my wall sculpture to be exhibited in Albuquerque, New Mexico at Stranger Factory Gallery. I’ll be having a solo exhibition with my newest painting, drawing and sculpture and my animated film in June 2017 at Janine Bean Gallery, Berlin, Germany. Really beautiful work. Ok, ok, I’ll get back to the studio, stat! Gorgeous! Thank you for making them. And the Lost Civilization wearable sculptures on your website are wonderful. I saw your art Lori in Palm Springs a few years ago and was just blown away…I was in that galleries booth for a long time just looking at all the amazing details!! I’ve been a huge fan since! Thank you Kathryn – I appreciate your taking time to look in Palm Springs. I wish I’d been able to attend myself…my work has all the fun. L.
Thank you so much everyone for your kind comments and support of my work…very nice to see! Email me if you’d like to get on my private mailing list for upcoming exhibitions and private sales of my work – sign guestbook on the website with contact info. 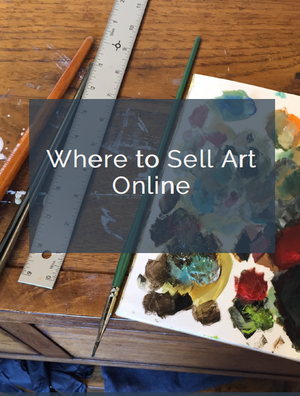 thank you artsy shark.com for the feature. I have definitely been seduced by your work. Beautiful.